Enjoy vivid LED pictures on this Philips display. Equipped with SmartControl lite, it’s a great choice! • SmartContrast is a Philips technology that analyzes the contents you are displaying, automatically adjusting colours and controlling backlight intensity to dynamically enhance contrast for the best digital images and videos or when playing games where dark hues are displayed. When Economy mode is selected, contrast is adjusted and backlighting fine-tuned for just-right display of everyday office applications and lower power consumption. • White LED's are solid state devices which light up to full, consistent brightness faster saving startup time. LED's are free from mercury content which allows for eco-friendly recycling and disposal process. 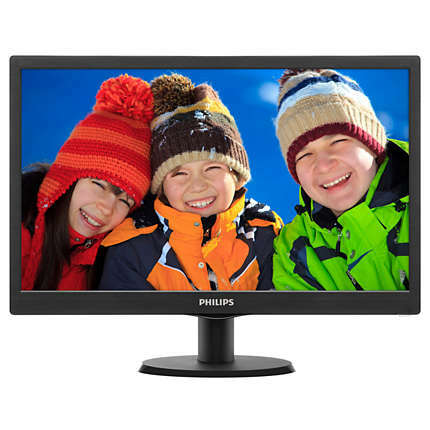 LED's allow for better dimming control of LCD backlight, resulting in super high contrast ratio. It also gives superior colour reproduction thanks to consistent brightness across the screen.